Even before I came to St. James Academy and joined St. Benedict’s Community (BENE! DICT! ), I had been a big fan of the Father of Western Monasticism. At first, I was inspired by his commitment to radically following Christ rather than getting caught up in the distractions of the world. But later, I found that I have a Benedictine spirituality, finding that a setting the rhythm of my day around prayer can bear great fruit in my life. So I’m Benedict ’til I die. 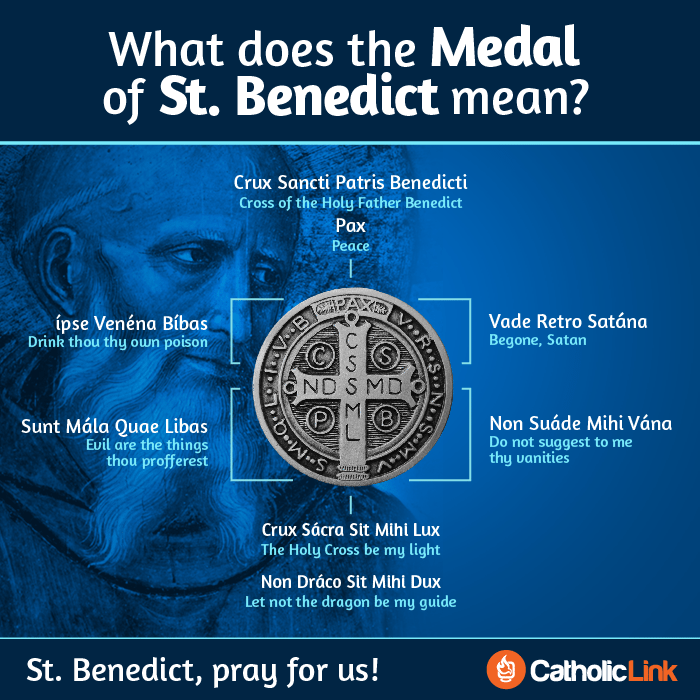 Anyway, I thought it was great to run across this story today about the significance of the St. Benedict medal– undoubtedly one of the coolest medals in Catholicism. The medal is a way to obtain God’s blessings and protection through the intercession of St. Benedict. Wearing it is a way to remind ourselves of our life in Christ and the promises of heaven. It is a form of prayer and yet another way we can incorporate God into our daily lives. The article also includes a long YouTube video about St. Benedict. It’s 1:28:35, so I’m waiting to watch it some other time.